A simple guide to having a mammogram from the Royal College of Radiologists. A database of patient experiences. 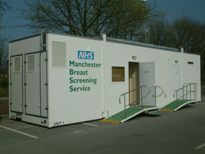 The Genesis Breast Cancer Prevention Appeal is the only charity in the UK dedicated to the prevention of breast cancer. The charity funds vital research into breast cancer prevention strategies and promotes breast screening and early diagnosis. The Greater Manchester Public Transport Planner.